BOULDER, Colo. – Symbolism sometimes makes more of a difference than money in bringing about change in higher education. That’s what Emily Miller, associate vice president for policy at the Association of American Universities, has found in her work with the AAU’s Undergraduate STEM Initiative. It’s also a strategy she has adopted as the initiative expands its work in improving undergraduate teaching and learning at research universities by encouraging adoption of evidence-based practices. Miller provided an update on the work of the STEM initiative for the Bay View Alliance, whose steering committee met at the University of Colorado, Boulder, one of its member institutions, earlier this month for its semiannual meeting. She pointed to an approach to systemic and sustainable change to undergraduate STEM teaching and learning in a framework that AAU has developed. The framework recognizes the wider setting in which educational innovations take place – the department, the college, the university and the national level – and addresses the key institutional elements necessary for sustained improvement to undergraduate STEM education, Miller said. 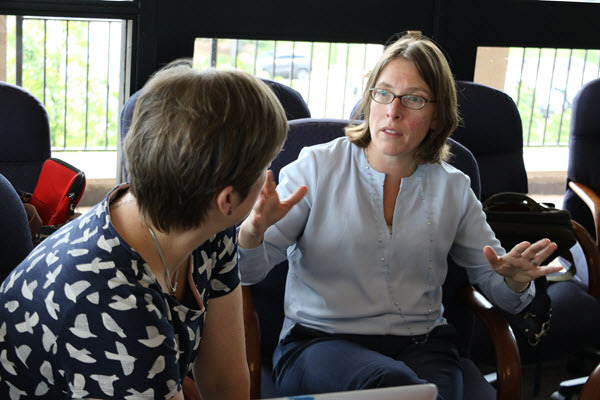 Emily Miller of the Association of American Universities speaks with Jennifer Normanly of the University of Massachusetts, Amherst, at the BVA steering committee meeting. The framework, which was vetted by campus stakeholders at 42 AAU institutions, guides the work of the initiative. Miller said that 55 of 62 AAU member universities had participated in activities hosted by AAU, engaging more than 275 faculty members and institutional leaders. “Simply put, there’s has been widespread enthusiasm and interest in the initiative and impressive changes in teaching and learning,” Miller said. Miller said instructors needed to draw on the same skills they use in teaching students to inform the public about science and science education. That outreach is also critically important, she said, because it helps to demonstrate the societal benefits of federal investment in science. This is an area where AAU has redoubled its efforts to promote the importance of government/university partnership in response to significant cuts to research budgets at the National Institutes of Health and the National Science Foundation, among other federal agencies, Miller said. Since the STEM initiative began in 2011, it has received nearly $8 million in grants from foundations and the federal government. And though it has awarded several universities $500,000 over four years to improve STEM teaching, Miller sees just as much value in smaller mini-grants. Twelve universities, including KU, recently received those mini-grants, and the AAU plans to put out a call for another round of grants next year. Doug Ward is the associate director of the Center for Teaching Excellence and an associate professor of journalism. You can follow him on Twitter @kuediting. Mary Deane Sorcinelli is a senior fellow at the Institute for Teaching Excellence & Faculty Development at the University of Massachusetts Amherst, and a co-principal investigator of the AAU Undergraduate STEM Education Initiative. Both Ward and Sorcinelli participated in the recent BVA steering committee meeting. Tagged course transformation, evidence-based teaching, remaking higher education, STEM.